I wrote Epiphany as if I were translating Late Middle Narahji and Modern Tveshi into English because everything in The Seven Papers is a primary source. (Seven is the name of the person who writes the majority of it, so it’s the equivalent of saying the Lincoln papers: It’s mostly Lincoln, occasionally people in dialogue with Lincoln. There are redacted reasons Seven is named Seven.) Late Middle Narahji is the orthography and grammatical rule system used until the 1880s, when a comprehensive spelling reform and grammar update are done to have written Narahji more in line with the way things are pronounced. Because these cultures have always had writing, language change eventually needs to be enforced with such changes. We’re overdue for one in English. 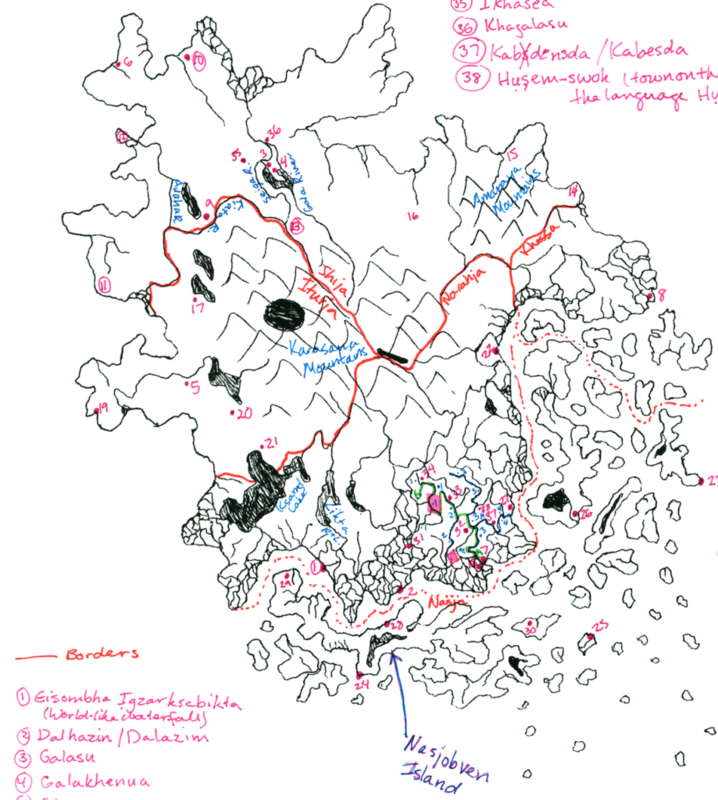 This is a closeup of the Tvaji continent from my legit working notes — I clipped the image so you wouldn’t see important plot writing on the right. In it, you can see that Tvaji is made of two countries — Tveshė and Khessa. I have actually just labeled the regions of Tveshė and not the whole country here. There are five official language groups in Tveshė: Sabaji, Narahji, Nasji, Hụkankị, and Iturji. The map above is a legit working map that I use while writing. You’ll notice that there’s another region, Khessa — that is the only other country on this continent. The Sabaji languages are Galasuhi, Galasuhi Tveshi, Tveshi, and Shiji. These are all spoken in the northern part of Tveshė, in Shija. Galasu is the place of the monarchy’s seat. Iturji is spoken in Iturja. Iturji shares features of Sabaji and Ịgzarhjenya languages, and it evolved out of a conquest creole (Sabaji rulers, Ịgzarhjenya commoners) spoken in the first millennium before Standard Count. It’s been its own thing for millennia at this point and can no longer be called a creole. Culturally, the Iturji are also a blend of Sabaji and Ịgzarhjenya practices. The Ịgzarhjenya language family has three subgroups: Khessi, Narahji, and Nasji. Khessi is spoken in Khessa and along the Tveshė-Khessa border. The language everyone means when they say Narahji is actually the Narahji language spoken in Menarka (which will become Menarga after spelling reform), Menarki Narahji. It’s the standardized Narahji taught in schools. Narahja is a huge area filled with canyons. Southern Narahji and Western Narahji are as similar to Menarki Narahji as Italian is to French or Romanian. Nasja is a series of cliff-islands, and so Nasji as a language refers to the Nasji language spoken on Nesjobven Island. The Nasji of the other islands, again, is related, but not identical. Hụkankị is a language family from the Middle Depths and Deep Canyons in Narahja. It is spoken by the Hicịptụ, a diverse ethnic group that coexists with the Narahji in the Shallows and Middle Depths of the Canyons. The Hicịptụ keep to their own cultural norms and only spottily follow the laws and customs set by Tveshė despite living within Tveshė’s borders. There are many languages within the Hụkankị family with varying degrees of geographic isolation. We’re just going to look at one language in each group to see the kind of thing I’m considering when I write this prose: Tveshi, Iturji, Narahji, and one of the Hụkan languages, Hụkacu. Here is the example we’ll be working from: My daughter says that a young man started in the legal department today. He works in immigration and will be on several committees with her. He isn’t married. This is a great set of sentences. One’s daughter is a family member and receives intimate pronouns in languages that have them, and the young man is not known to the speaker and thus receives formal pronouns. Neither the daughter nor the young man is physically present. Meila mėi modaha gerovịsu mefamohi loja nerafa foalem kaula ịfa. Vė hat kurinnịhui yaveisaiamio vo vadi modakourasuić rohetedi shapui. Vė ni va aulatha hėi. Lit. My daughter (to say-present-indicative) in the legal department that a young man (to start-past-simple) (day-this-day). Le-formal (to work-present) in immigration and (to be-future) on several committees with lim-informal. Le-formal not (to be-present) husband. Formal setting: Maduhibi kawa mịwi lịjị ratfauwibi wimag subuwosum fuña tsijokmị. Duosu kaurig nayugya tsi niwu juidra vubui ukaurusumuwo lịjị juisus kanawi. An juisu auluţu tsi ţaja. Informal setting: Maduhi kawa mịwi lịjị fauwiru wimag subuwosum fuña tsijokmị. Duosu kaurig nayugya tsi niwu juidra vubui ukaurusumuwo lịjị juisus kanawi. An juisu auluţu tsi ţaja. Lit. (To say) my daughter that (to start-past) today inside of department legal le-formal-virile-aged-man. Has job immigration-y le-formal and (to be-future) with lim-informal on committees that several are. No (to be-present) husband le-formal not at all. Post-1880s: Tazæla kækyåv mosmur öfak ku gaxumtyasakla lịrsaböz gådzinælaịrru ku yozeira ị̈ma, sabnuyikdas. Kul gaxubëdasakla kækyåvalbas glabdemlịrra atsov. Ogalamælaneu. Lit. Says my daughter re: a young man started today in the legal affairs department, in immigration. On committees in company of the daughter will be the man who works outside of the home. Le isn’t married. Ratasora kapt kụ kị rė ksanora ịdal ha coksa tepahụkor leken saso, sorora ru hun. Kurora ha raḥumacel sel kalora ịtal ema rė kapt en akịsa kụḥor. Kalora hė ha hụkeplacel. (To observe-present-subject-not-physically-present) daughter me belonging to that (to start-subject-not-physically-present) (past marker) in department legal man young-masc, (to-come-to-pass-subject-not-physically-present) this day. (To work-present-subject-not-physically-present) in immigration and (to be-subject-not-physically-present) (future marker) alongside that daughter on committee (plural marker). (To be-subject-not-physically-present) not in marriage. This is one of the big reasons I chose GNP for Epiphany and the rest of The Seven Papers: I’m trying to make the implicit translations as true as possible to what the original would look like.